My hostel is located in Chinatown, Kuala Lumpur were you can find most oft he cheap sleeps in the city. It´s a impersonal place but cheap. I was not up to stay for long so it was more than ok for me. After a small cup of tea I started my sightseeing day in Kuala Lumpur. It took a while to enjoy my day. The smog in this city combined with the high temperature make a sightseeing day hard work. 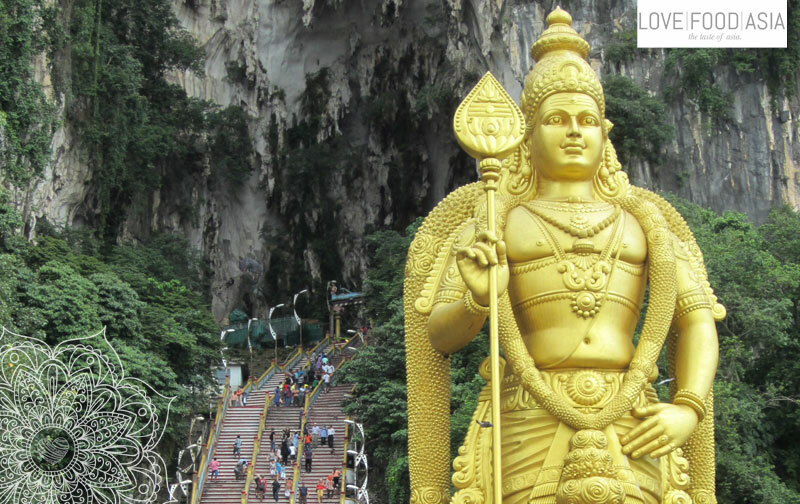 So it was the right decision to take the metro to the Batu Caves; 15 km out of the city. The holy caves are a religious and spiritual place of the Hindus and it´s always crowded there. Inside the caves are a few Hindu temples. There are 3 caves and you can visit two of them without paying any fee. Inside it looks a bit like a crib with Hindu figures. An impressive view and a must see when you come to visit Kuala Lumpur. Hindu god Murugan. This statue was built from 2003 to 2006 and is the starting point of many steps up to the caves. On the steps you will be guided by many macaques so take care of your belongings. The nasty monkeys will steal everything you haven´t fixed on your backpack. After the trip to the caves I went back to the city to visit the National Mosque of Malaysia. It has a capacity of 15,000 people and is situated among 13 acres (53,000 m2) of beautiful gardens. Also a must see in KL. In the evening I went out in Chinatown to find some street food. That´s definitely not a problem here. Just walk around and have a look at the places were all the locals are eating. Step in and enjoy good and cheap food. Next PostHappy New Year from Love.Food.Asia.